Please post additions or corrections here. These are all from Maui Brewing in Lahaina, except the cabottle and the two on the far right. Those are from Portland, which makes a perfect tie-in for me! Sent from somewhere in iWorld. 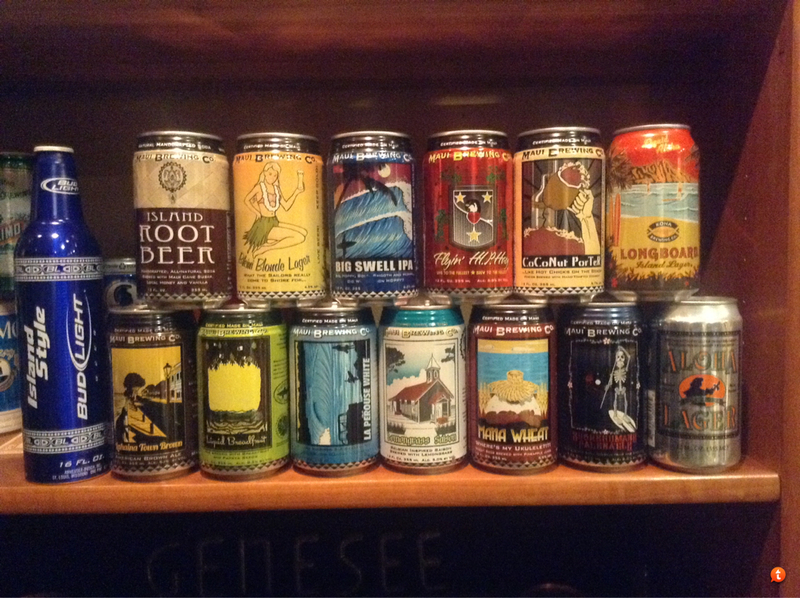 There is also all the Primo cans beginning with the ill fated alum flat top. Don't forget the Schlitz cans with the dot over Honolulu. Some real sleepers there, and they were straight steel long after Schlitz was in Aluminum everywhere else. Did Schlitz produce any other brands in Honolulu? The only one I have is a Schlitz Light that otherwise doesn't come in straight steel and is therefore easy to spot. I actually bought it because it was straight steel. It wasn't until later that I figured out it was from Honolulu. I've been told Schlitz and Schlitz Malt Liqour exist. Imagine how many of them you'd have to look over before you'd find one from Honolulu. Don't know of any other brands. Thanks kruegerbock that gives me some more things to flip in peoples totes! Here are the variations that my friend Boardman mentioned on the Longboard cans. and here is my cubby-hole of Hawaiian breweriana. I admit I don't have much. I think the pre-pro cork screw is pretty cool. It is from Olympia Brewing. and yes, I am still missing the Primo "EXPORT" can. By the way, the Aloha Beer can was..."BREWED AND BOTTLED ESPECIALLY FOR THE MAUI BEER COMPANY BY G. HEILMAN BREWING COMPANY PORTLAND, OREGON"
I contacted Maui Brewing and learned that this was not related to their company, but an 80's marketing company. I love the Hawaii - Oregon ties. Check the composite list. There is a Schlitz, two different Schlitz Lights and a Schlitz Malt Liquor from Honolulu. I speculate that there is an Old Milwaukee as well, but I have not found one yet. I have both Schlitz Malt Liquor and Schlitz Stout Malt Liquor cans from Hawaii. I'll post a photo later. I have two different Schlitz Lights and a "regular" Schlitz from HNL. I saw a stout malt liquor on eBay, but was not aware that a (non-stout) malt liquor existed. Here are all my Schlitz cans from Honolulu. I believe I have all of the Primo's but I can't find that photo right now. As you can see, my Malt Liquor is not "Stout." Please post a photo of your Stout Malt Liquor. I would love to see it. Strange that they would need both versions in a small market unless they were sent to Alaska or some of the US Pacific territories like American Samoa, Guam, Northern Mariana's, Johnston Island, etc. Also, I have been diligently looking for an Old Milwaukee from Honolulu. There has to be one. I can't believe they would have made all of their other brands in Hawaii except that one. Everybody be on the lookout for a straight steel Old Milwaukee with a UPC. Then check to see if there is a dot over Honolulu. The two early foil "shiney-steinies"